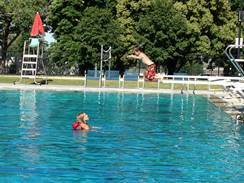 Registration for swimming lessons taught at the Brigham City Outdoor Pool begins March 1st and runs through the month of March each year. 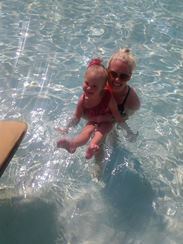 To register online for swim lessons, click here. If you prefer to pay with cash or check, please come to the Recreation Office located in the Hervin Bunderson Center at 641 East 200 North, Brigham City from March 1st to March 31st (Monday through Thursday 8 to 5 and Friday 8 to 12). Lessons are taught 40 minutes Monday through Thursday for two (2) weeks. The cost for lessons is $15 for the Parent & Tot class (6 months to 3 years old) and $35 for all other classes. * NEW * Now offering Saturday Morning Swimming Lessons. Lessons are taught 60 minutes on Saturdays for four (4) weeks. The cost for lessons is $10 for the Parent & Tot class (6 months to 3 years old) and $25 for all other classes. ATTENTION PARENTS! Our Lesson Provider has changed! We are Proud to be partnering with STARFISH AQUATICS INSTITUTE. This class is for children 6 months to 3 years of age! To familiarize young children to the water and prepare them to learn to swim in the Starfish Aquatics Swim Schools. It is not designed to teach children to become good swimmers or to survive in the water on their own. ALL children under the age of 3 are REQUIRED to wear a swim diaper and plastic pants. If you arrive for the class unprepared we cannot allow you to participate. Very afraid of the water. Will not get face wet. Can't swim without support but loves the water. Your child is not afraid! Private lessons are a one to one swim lesson which is held on Tuesdays, Private swim lessons allow the instructor to focus solely on the needs of their student. Our instructors will work with the student to create a swim lesson that is both fun and instructional. Each lesson is 30 minutes in length and is offered at 7:00-7:30, 7:30-8:00, 8:00-8:30. Cost is $20.00 per session. The Starfish Aquatics Institute is dedicated to safety and swimming and believes that all children should learn to swim. Starfish is also USA Swimming affiliated. Brigham City is excited to partner with SAI and our hope is that you and your child will love it just as much as we do! 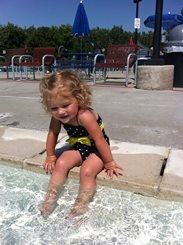 CLICK HERE to register for our Swim Lessons! As always, feel free to contact us with any questions or concerns you might have.